Livin’ Large on the OBX! : Memory Monday June 30, 2015. Livin’ Large on the OBX! This week’s Memory Monday photo submission comes to us from Trisha Dunnavant of Victoria, Virginia who stayed with Outer Banks Blue in the property “D Sea 9” in Nags Head. 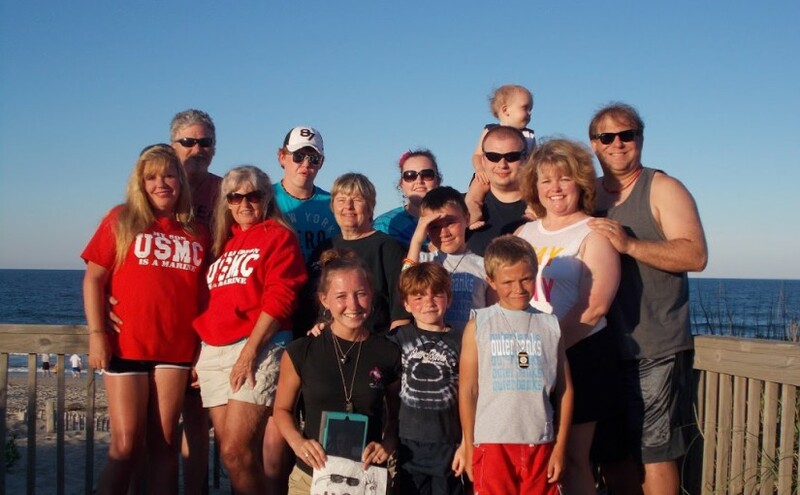 It has been hot, hot, hot lately on the Outer Banks, but you can tell from Trisha’s photo memories of her family’s visit that they had a great time at the beach! Thanks Trisha….it looks like your family had a great time with Outer Banks Blue! We look forward to serving you again soon. All the best from the beach! Whasssup?! : Memory Monday April 27, 2015. This week’s Memory Monday Photo submission comes to us from Renee Rohrs of Catonsville, Maryland who stayed with Outer Banks Blue in the property “Tarheel Treasure” in Corolla. Renee shares with us a photo of Claude and Wyatt who are Renee’s four legged family members who also enjoyed a stay with Blue at the beach! This is a good time to remind you that your dogs stay free with Outer Banks Blue! That’s right there are no extra charges for pets on our select properties that allow dogs. Another differentiator for guests that stay with Outer Banks Blue! Thanks Renee, we are glad that you Wyatt and Claude had a great stay on the OBX with Blue! We look forward to serving you and your pets soon! Taking It Easy: Memory Monday April 13, 2015. That is the caption that came with this photo which was entered into our Memory Monday Photo Submission contest. 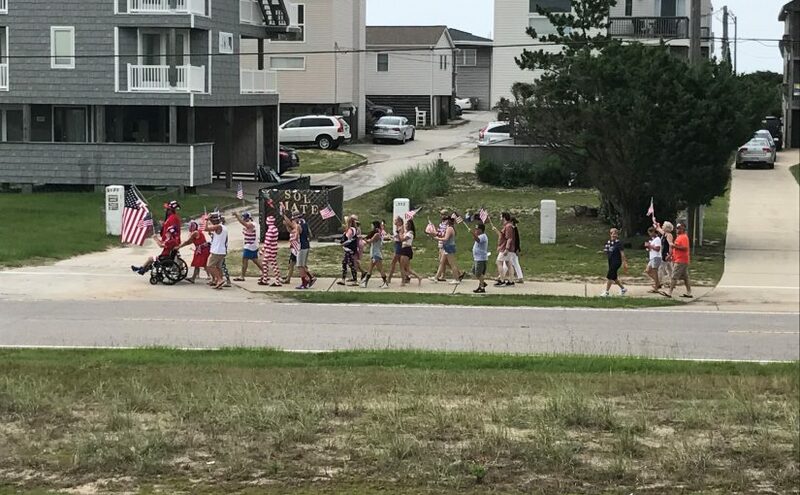 Thanks to Jackie Visbisky of Dickson City, Pennsylvania who stayed with Outer Banks Blue in the Duck vacation rental property “Ruby’s Treasure” for sending this photo along for our consideration. There’s nothing like a nap in the sand on the Outer Banks! Thanks Jackie for sharing your photo memories. We look forward to serving you and your family again soon. Keep in mind that every Monday we post a new photo submitted to us from one of our guests for your entertainment and review. Each month we choose one of our entries at random to get a $100 discount on your next rental with us if your picture is the randomly chosen one. Corolla Memories: Memory Monday January 26, 2015. This week’s Memory Monday photo submission comes to us from Tim Santo of Hillsdale, New Jersey who stayed with Outer Banks Blue in the vacation rental property “Aurora” in the Corolla Light subdivision. While Tim and his neighbors in New Jersey are preparing today for a record breaking snowfall we try to warm his spirits today by reminding him of his visit to Corolla last August. The boat basin at the Whalehead club is a nice place to spend an afternoon in the summer. Light breezes off of the Currituck sound warm the soul and remind us of why we love this place so much. There’s also nothing like an adventure walk on a path through the woods nearby. Thanks Tim for your photo memories. A reminder to all of our friends that we post photo memories here each Monday which are submitted to us. Once per month we select a random entry as our winner and that winner gets $100 off their next year’s stay with Outer Banks Blue. Get us your entries and look for them to appear here! Look Out Below!This week’s Memory Monday Photo Submission comes to us from Julie Coffman of Port Republic, Virginia who stayed with us at “Letting Go II” in Corolla.With the hot temperatures coming this week who wouldn’t want to trade places with this guy?!! It is mid-May which means only one thing for a lot of folks – Strawberry Picking time!The endless winter of 2014 made for a slow start to the season, but things are in full swing now as all of the local spots are open and the fields are full of folks getting their fill of the tasty fruit. When you’re traveling with kids of any age, you know it’s critical to pack everything possible to make their experience a real treat. However, even though you’ll drive to the Outer Banks, it may not be feasible to bring all they want to your vacation destination. When booking your family-friendly vacation rental, make a point to look for these five amenities. They go a long way to ensuring your little kids, tweens and even teens have a memorable time. Sleeping in a new environment is a fun experience for kids of all ages – if there is age-appropriate bedding, that is. Look for kid-friendly options including bunk beds, dorm-style rooms, single beds and other choices that will allow your children to have a blast and sleep soundly. Vacations are about having fun, so search for properties that offer games. Whether good, old-fashioned game tables (such as air hockey or foosball) or video game consoles such as Wii or Xbox, the entire family can play together. It’s impossible to control the weather during every vacation. Planning for days with poor conditions is a must when you have kids. Rentals that provide DVD players are a lifesaver in these instances. A quick trip to the local rental machine or store can turn the tone from tearful to joyful. The extra room that bedding, chairs and other essentials take up in your vehicle can be a strain. Look for vacation rentals that provide porta-cribs, highchairs, pack-and-plays, etc. to ensure your baby has everything s/he needs. Whether you’re reserving a beachfront cottage or a luxurious golf-course manor, a private pool is a must. Smaller kids can quickly tire of the wind, noise and confusion on the beach. Having a quiet pool all your own to relax or play in is the perfect alternative. When you search the Outer Banks Blue site, be sure to check the box for “baby equipment.” You’ll be shown vacation rentals offering necessities that will make your child’s stay (and yours!) more enjoyable. Duck Donuts now in Williamsburg and Virginia Beach!Duck Donuts, a long popular temptation for visitors to the Outer Banks, recently expanded their operations to include locations in Virginia.A franchise of Duck Donuts opened in Williamsburg in October of 2013 at The Monticello Market Place Shoppes. A second franchise opened in Virginia Beach in January at Kings Grant Road and Virginia Beach Boulevard. Another location is planned for Richmond, co-owner Robin Griffith said.Duck Donuts is know for its fresh-baked cake doughnuts and an array of glazes and toppings to create a custom made treat for each customer. Our favorite toppings include coconut, chocolate, vanilla or lemon icing, and of course -sprinkles. It is not unusual for patrons to wait in lines that stretch out the front door of the store during the morning rush for these goodies.Out-of-town customers have begged the owners for years to open where they live, and 25 to 40 would-be franchisees each year request their own store, Griffith said.Duck Donuts, opened in 2007, is among Outer Banks Vacationers’ favorite stops each year with locations in Kitty Hawk, Corolla, Kill Devil Hills, and of course their first store which is located in Duck.We wish Robin and partner Russell DiGilio great success with the new Duck Donuts locations!All the best from the beach! Day at The Beach!We hope you are enjoying this Martin Luther King, Jr. holiday. Whenever there is a holiday at the beach we think of heading to the beach, and indeed this week’s Memory Monday Photo submission reminds us of that.Loreal Hooten provides this week’s pictures of a day at the beach in the “Four Wheel Drive Territory” of the northern Outer Banks. As anyone who has been there knows where the pavement ends in Corolla the fun on the beach begins as there is another 12 miles of beach only accessible with four wheel drive vehicles.Loreal’s photos reminds us of that area and a fun day her family had there.